With their very low capital cost - a good one can cost as little as Â£35 - even the most rudimentary workshop can justify a double-ended grinder. However, surprisingly few users ever seem to bother about basic care and maintenance of what is potentially one of the most dangerous machines in their workshop. 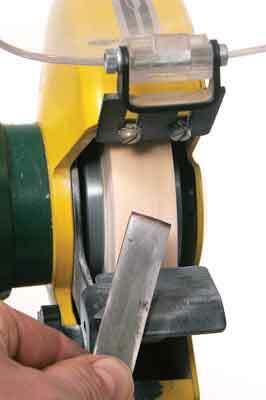 Like many tools, a grinder is only as good as its cutting element, in this case the grinding wheel itself. It must be kept sharp and flat to function effectively. The main problem with grinders is that when used regularly the open grit of the wheel tends to clog with metal particles, particularly if you use the wrong grade of wheel. In theory, if you match the right bonding agent and grit hardness to the particular type of metal you are grinding, to a large extent the wheel should be self-cleaning. The problem with this is that a grinder has to be a general-purpose machine, meaning we cannot have a stock of different wheels and keep changing them for each different grinding application. With normal use the surface of the wheel eventually becomes glazed, particularly if you are naughty and use it to grind soft metals like aluminium or even try to trim bits of timber or sharpen your pencil on it! You then have to apply serious pressure to get it to cut, leading to the tool edge overheating and burning. Lack of understanding about their maintenance is why dry grinders get a bad name as an aid to sharpening. The remedy for all this is to dress the stone regularly, which means removing the top glazed layer to expose a fresh, sharp cutting surface. This new layer should then grind off metal with very little pressure, resulting in a cooler, safer grind. 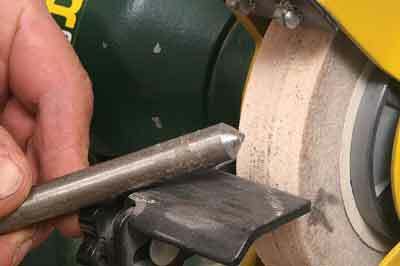 Even brand new grinding wheels need dressing to get them concentric on the spindle and to remove the hard outer surface, which is often left by the manufacturing process. There are three types of wheel dresser available, all having slightly different uses. First is the star-wheel dresser, which is used when the surface of the wheel requires radical cleaning or reshaping. 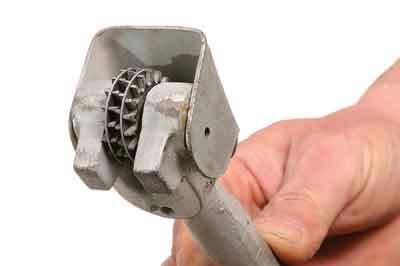 This crude tool consists of a heavy-cast holder housing four star-shaped wheels loosely located on a simple axle. 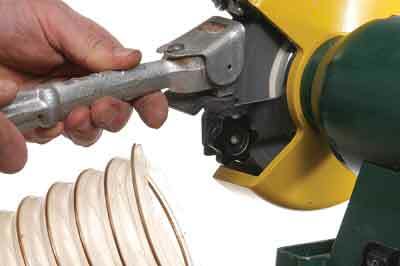 On larger-diameter grinders the lugs of the casting are meant to hook over the edge of the toolrest to give extra grip. For most of the grinders though there isn't sufficient travel on the toolrest to move it back far enough, so it is used with the lugs on the rest. The diamond dresser is a tiny industrial diamond mounted in the end of a metal rod. These are used in a trailing attitude, but I find them more difficult to control for general dressing. However, their precision makes them ideal if you want to shape the wheel to an intricate profile, e.g. for cutter grinding. Newer diamond dressers consist of a small pad impregnated with diamonds, making them easier to control and use, but they are an expensive option for only occasional home use. The last dresser is the devil stone. It is a stick of hard carborundum, which is a bit less severe in use than the wheel dresser, as it seems to just remove individual particles rather than bigger clumps. 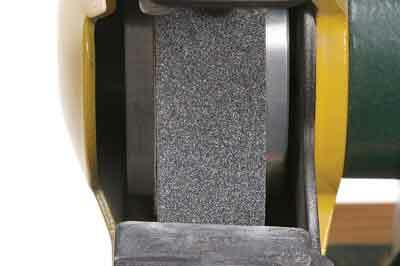 This means the dressed wheel surface is much smoother and presents a better face for grinding. It is pressed onto the revolving wheel, moving it from side to side rather than just feeding it straight in. On the softer white stones it will soon remove the top clogged layer - in fact, you must be careful not to overdo it and remove too much. The new surface is wonderfully straight and sharp, and with light but regular use of the devil stone it should keep the wheel in good trim, but if it gets really clogged or worn you may have to start with the star-wheel dresser. 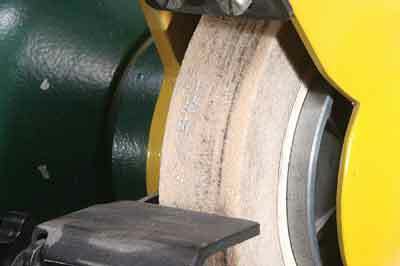 Despite its appearance, a badly misshapen wheel with deep grooving and severe clogging can soon be put right. For a hard bonded stone I start with a star-wheel dresser, but whatever you use this process will generate a lot of highly abrasive dust so it is worth using your extractor to catch the worst of it. 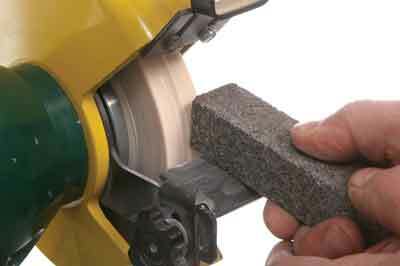 With the grinder running at full speed, place the wheel dresser firmly on the toolrest and push it square into the face of the wheel. The wheels will spin violently, making a great deal of noise and dust, but keep pressing firmly to get the cutting effect. Keep the pressure on by gently raising the handle and move the dresser from side to side across the face of the wheel. 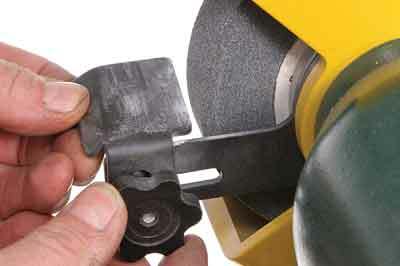 Angling the dresser slightly across the face of the grinding wheel often makes it easier to control and reduces the amount of vibration. Keep this up until you can see that all the grooves have been removed and that a clean fresh surface is exposed. Use the edge of the toolrest as a visual guide to keep the face square. 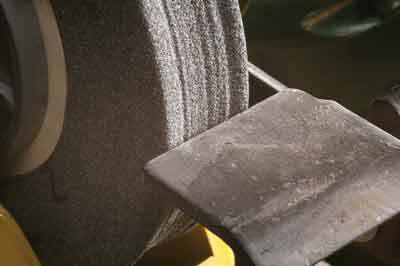 If you stop the grinder at this stage and look at the surface it appears quite rough, with clumps of abrasive torn out. Although this will grind satisfactorily it is not ideal, so now run over the surface with the devil stone to smooth it off a little. This puts back a much more even surface. If you have had to remove a significant amount of wheel to get it true, make sure you adjust the toolrest and top guards to bring them back in close to the wheel. Your grinder should now cut freely and with little overheating, making grinding almost pleasurable. For any serious work on the grinder, always wear safety glasses and a full-face visor; this will give added protection from flying sparks and grit. 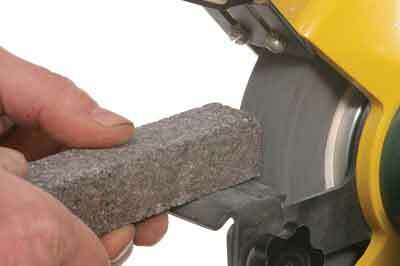 The other potential - though remote - danger is that grinding wheels can disintegrate during use, throwing around fragments. Although this really is rare, it can happen and a proper impact-resistant visor is the obvious safeguard here. Always wear eye protection of some sort - relying solely on the spark guards fitted to the machine is really not very good working practice.